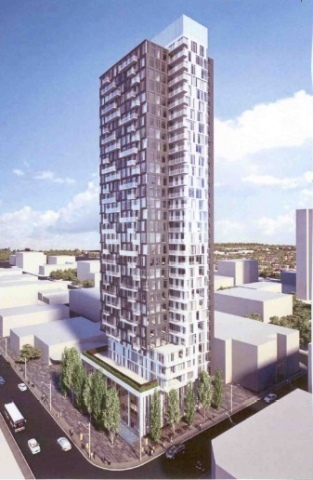 Toronto developer (Brad) Lamb Development Corporation was marketing in 2012 for this 31-storey $62 million tower that is to house 230 smaller suites for young professionals who will walk to work downtown or in the Beltline, and many of whom will not own a car. The site will only accommodate about half as many below-grade stalls as there will be suites, so watch for an in-house car rental or co-op arrangement. Suites are to range from studio-sized 400 square feet to two-bedroom homes of 950 square feet, plus a few penthouses, all with nine-foot ceilings, a natural-gas range and a balcony natural-gas outlet. A number of pre-construction sales will be needed before the current parking lot yields to this development, although Mr. Lamb hopes to break ground late in 2012.